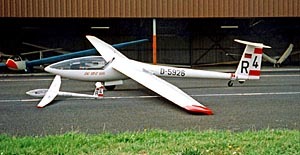 The DG-100 of 1973 is the first sailplane type manufactured by Glaser-Dirks. It is built of glass reinforced plastic and has an all-flying tailplane and a two-piece canopy. The original DG-100 was superseded by the DG-101 and DG-101G. These successors have improvements such as single piece canopies and, with the DG-101G, a conventional tailplane with fixed stabiliser and movable elevator. After the bankruptcy of Glaser-Dirks the new founded company DG Flugzeugbau GmbH took over the service for these gliders. This page was last edited on 6 March 2007, at 08:42.